The world’s chocolate production is at a tipping point. Two-thirds of the world’s cocoa is sourced from trees of individual smallholders in just two countries in West Africa: Ghana and Cote d’Ivoire. While demand for chocolate is expected to increase by 25 percent in the next decade, a huge percentage of West Africa’s cocoa trees are well past their most productive years and yields are projected to decline. This leaves two options: either expand production into West Africa’s dwindling forests, or rehabilitate aging farms. The choice is clear. 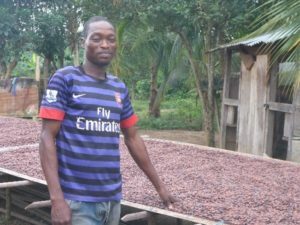 Recognizing the risk to their survival, the world’s chocolate companies are increasingly supporting efforts by their suppliers, like Ecom Ghana, to rehabilitate farms by providing improved seedlings and extension service to cocoa farmers to rehabilitate farms and increase productivity. Yet even with this support, Ecom has found a surprising number of farmers reluctant to rehabilitate their unproductive farms. Enter Andrews Darling, a cocoa farmer in Nyame Nyae village in the cocoa-growing region of Ghana, who migrated to the area from northern Ghana 14 years ago. Andrews says, “When I came to this area, I was 24, and I made an oral abunu agreement with the landowner where I would clear land and establish a cocoa farm with him. We agreed that we would split the farm 50:50 when the cocoa is mature. Now, my farm is getting older and I know that I will need to rehabilitate in the next ten years, but I know that if I replace trees, my landowner will object. The land could produce more with new trees, but I can’t risk being pushed off.” Migrants working on abunu oral contracts have limited security of their long-term rights to the land, and are thus unlikely to rehabilitate their farms. Andrews’s village supplies all of its cocoa beans to one company – Hershey’s. Based on USAID surveys, over 60 percent of Nyame Nyae farmers are migrants with limited rights to rehabilitate the farms on which their livelihoods are based. With USAID help, Hershey’s and its local buying agent, Ecom, are supporting local farmers to document their abunu (landlord-tenant) agreements, and include provisions that allow tenants to rehabilitate their farms without risk of losing them. Teriah Agyarko-Kwarteng, Hershey’s West Africa Sustainable Sourcing Director, noted, “In Ghana in recent years, insecure land rights has been raised in meetings in Accra as an issue facing productivity in the cocoa sector, but we have never had concrete actions that we could support as a business. With USAID’s help we are finding entry points that are practical cost-effective at the scale our business works in.” The templates developed under USAID support are expected to become a part of the standard extension services offered by Ecom to the smallholder farmers who supply Hershey’s, Mars, Ferraro, Nestlé, Lindt, and dozens of other small and large chocolate companies around the world. With more secure land rights, a new generation of cocoa farmers will be able to rehabilitate their farms and increase cocoa productivity while also improving their livelihoods.